It’s the week before Christmas, traditionally a very quiet period for visitors on Tenerife and in tourism terms, the lull before the storm. As soon as the turkey leftovers are covered in foil and popped into the fridge for later snacking, keyboards will be hotting up with holiday searches and the beaches and resorts of Tenerife will throng with northern Europeans thawing the ice from their toes. 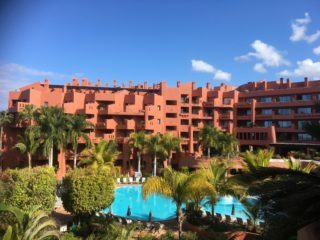 So before the madness begins, Tenerife Magazine headed to the sunny south west coast to check out what the stylish Hotel Barceló Santiago has to offer. This is a hotel that knows how to make its guests feel welcome from the moment they arrive. At reception, while the smiling Nancy goes through the details of my booking and the hotel’s facilities at my disposal, a chilled glass of cava appears before me bringing a smile to my lips and putting me firmly into holiday mode. Exiting the lift on the eighth floor with cava bubbles in my blood stream and a spring in my step, I open the door of Suite 819 to step into one of the coolest hotel rooms I have ever stayed in. Ice blue opaque glass screens, slate grey tiled effect walls and a bed so large I’ll need GPS to find the pillows lie before me – my own private paradise. And just when I think the WOW factor can’t possibly get any better, I open the curtains to discover ceiling to floor length windows and endless terrace beyond which the cliffs of Los Gigantes tower above the ocean. The white sails of dolphin watching ships glide below like toys on a pond. 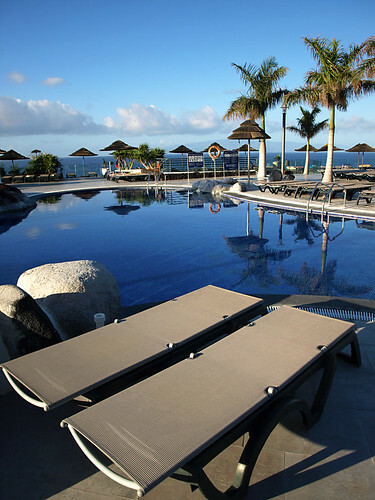 Pulling back the curtains on the other side of the room, the island of La Gomera is shimmering on the horizon and below me, the infinity pools of the hotel are whispering my name. Dragging myself away from the awesome views afforded by my room, I wander out into the warm sunshine to explore the gardens. 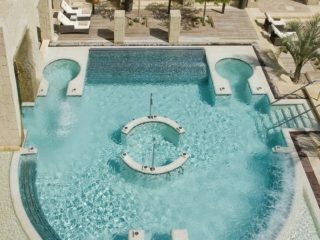 Ignoring the impulse to sink into one of the cane chairs beneath the thatched roof of the pool bar and order another glass of cava, I step over the footbridge, past the Jacuzzi where suntanned bodies are being massaged by water jets, and down the steps by the kiddies” club to the sports courts. A group of guests are enjoying a spot of rifle practice, supervised and tutored by two of the animation team. I linger awhile until one of the guests who is getting on in years and has a very distinctive arm shake steps up to the mark ““ no point in taking unnecessary risks. In the show bar there’s a stretching class in progress and the occasional grunt rises above the chill out music as muscles are put through their paces. I continue downwards, drawn by the aroma of incense until I arrive alongside the gym which is packed to the gunwales with state of the art equipment and completely devoid of guests, all of whom I suspect are being tenderised in the scented paradise of the hotel spa alongside. 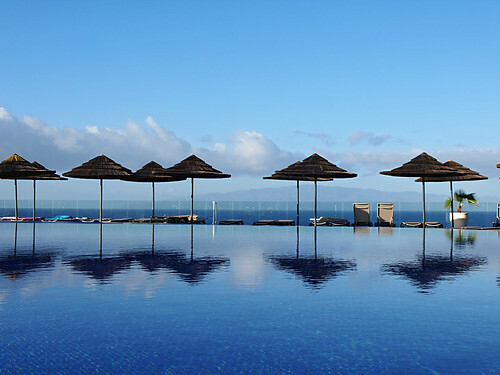 Back at pool level I place my towel on the comfy sunbed below a straw parasol and slip into the infinity pool where I float, watching the Los Gigantes ‘giants” in the heat haze and making a mental note to check the rules of this month’s free holiday at the Barceló Santiago. Perhaps members of TM staff aren’t excluded from winning? 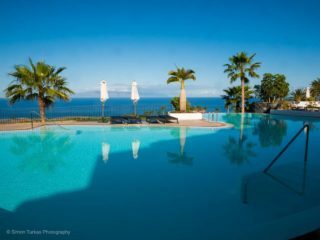 Location: On a small headland in the resort of Puerto Santiago overlooking the cliffs of Los Gigantes on one side and the neighbouring island of La Gomera on the other. 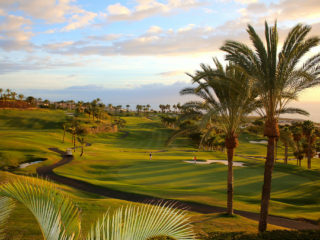 Throw into the mix the fact that the south west coast gets more sunshine hours than any other and you arrive at the conclusion that this hotel probably has the best location on Tenerife. Rooms: Rooms are stylish and comfortable in contemporary design with lots of floor space, terrace and flat screen TV with satellite. Décor is ice blues with the palest lemon and maximum use is made of the natural light to provide a calm and relaxing environment. It’s well worth paying a bit extra to take advantage of those spectacular sea views. Superior rooms and suites have even more floor space and tea and coffee making facilities. Service: In my experience staff can make or break the quality of a hotel. In the case of the Barceló Santiago the staff are exceptionally good. Wherever I went in the hotel I found multi-lingual, professional and friendly staff who had an excellent rapport with all the guests and who appeared to be enviably happy in their work. 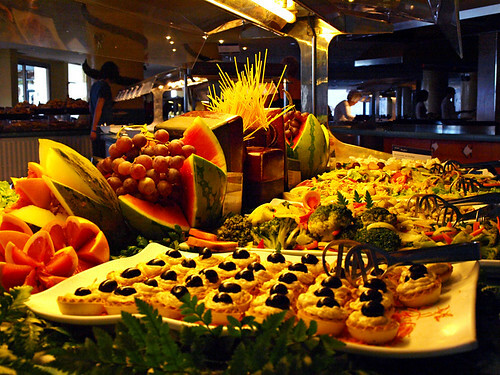 Food: I arrived at the Barceló after a late breakfast and intended only having a salad but faced with the delicious selection on offer in the buffet, I ended up with a lip-smacking three course lunch. 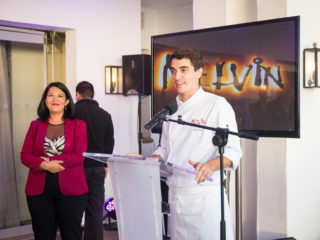 In the evening I chose to eat at the hotel’s a la carte Sabor Español restaurant where I was treated to excellent food and wine served with savoir faire by the delightful Elvi. Entertainment: The evening kicked off with the mini-club during which the animation team kept the youngest guests entertained until bedtime. When the clowns exited stage left, the dancers entered stage right and kept the adults foot tapping and applauding for the rest of the evening. For a change of scene a mini stroll takes guests to Route 66 where they can get their kicks from resident bands Old Dogs New Tricks and Los Tres Hombres. 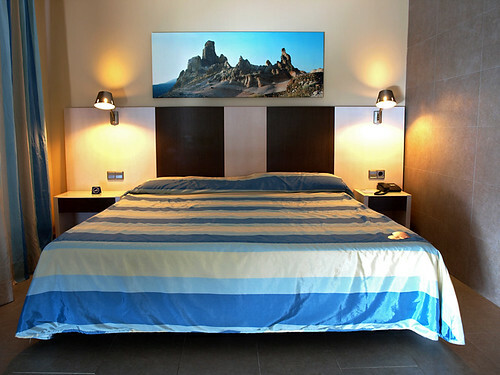 Overall: A stylish and comfortable modern hotel in a stunning location where families, couples and singles can enjoy the best of Tenerife’s sunshine, sunsets over La Gomera and excellent service from friendly and professional staff. I shall certainly be making a return visit.